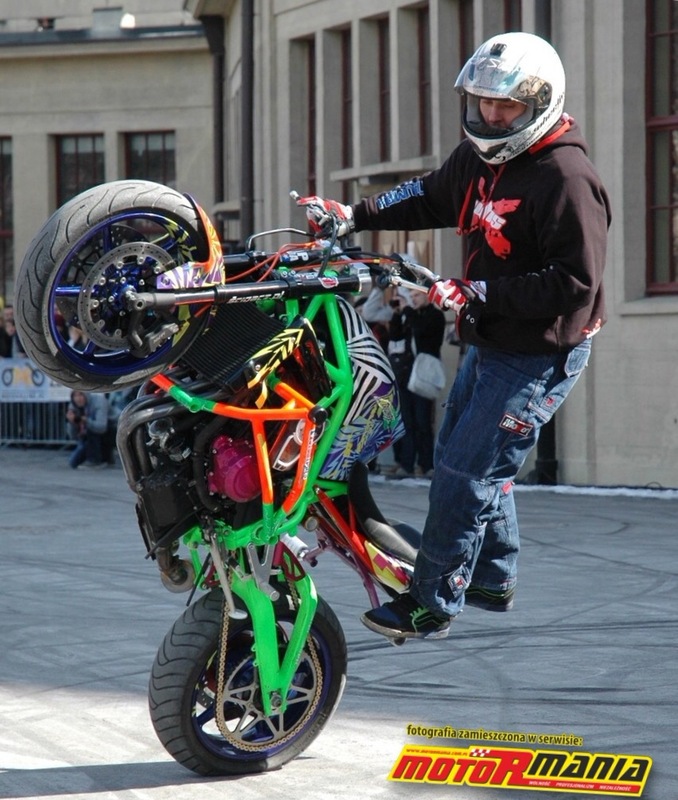 Wheelies, stoppies and all of the other balance necessitated shenanigans that stunt riders do. 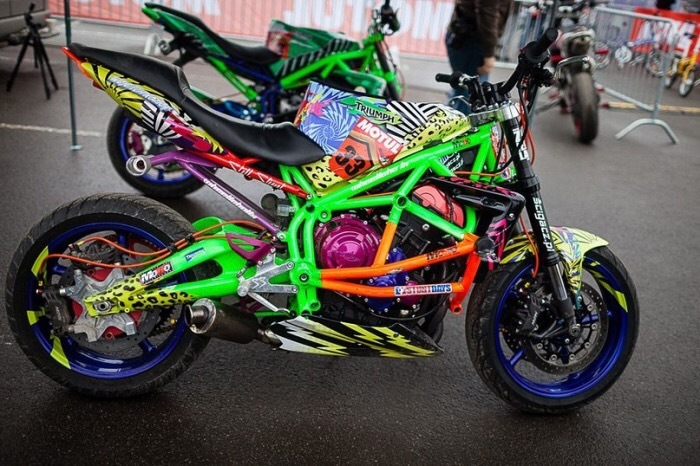 Also make the bike look like a crowd pleasin’ zany bright, zoom and boom machine. It’s the hip-hop of observed trials riding. my next Meriden project will be a tracker for sure. 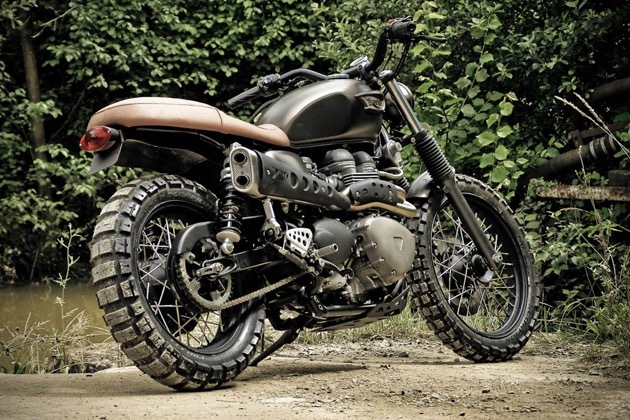 A British Racing Green color scheme looks like the way to go… Silver mudguards, blackened frame and a verdant tank. 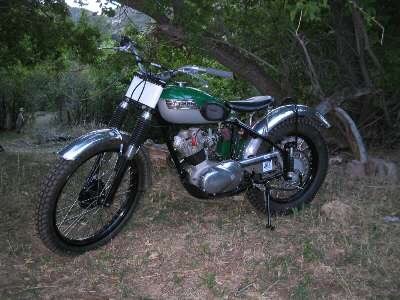 Some go for the white fenders. Here this leading link fork has a Greeves air to the proceedings. Green frame a little too much. This older fixed frame is a nice balance. Starting to consider a color scheme for the Cub. This one is looking good. 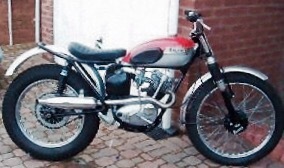 Classic red topped tank, silver mudguards and black elsewhere. It’s been a little while since we’ve seen this little fella on the blog. Some crucial body parts have been hard to come by. 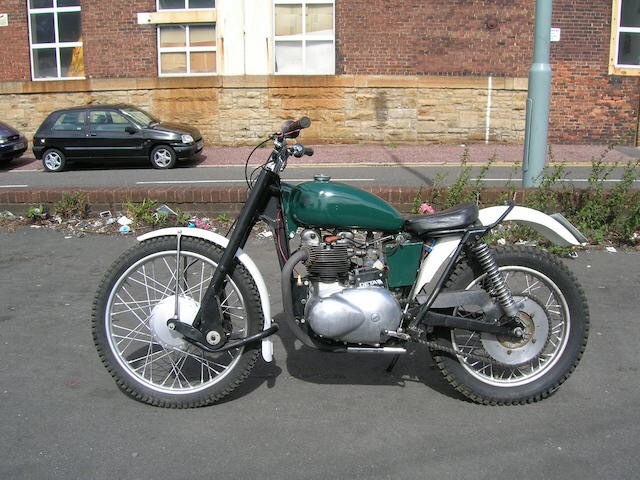 However I have both fenders, a short period trials seat, a clean tank. Looks nearly roadworthy! 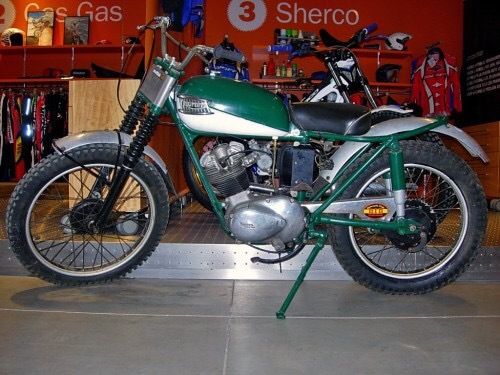 Exhaust pipe on the list next then the all important ignition set up – the pulse itself. 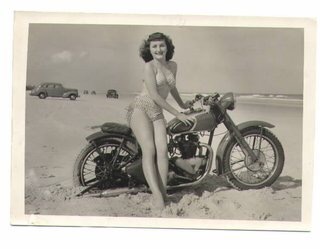 Beach Babe: a box brownie snap of someone’s love. Both two-legged and two-wheeled. Back when you just drove down to the waters edge and had a ride along the damp sand. You can smell the salty air and feel the gritty sand in your toes. Once more unto the breach, dear friends, once more; Or close the wall up with our English dead. 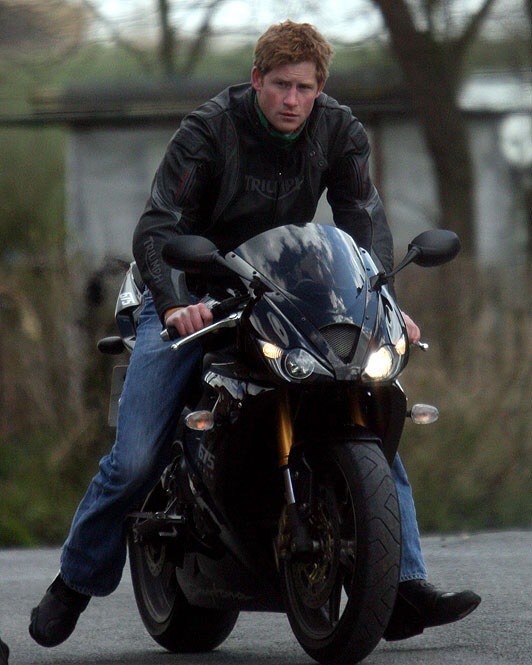 Will Shakespeare – Henry V.
Contemporary Harry on a Triumph Daytona. Different steed- British blood. 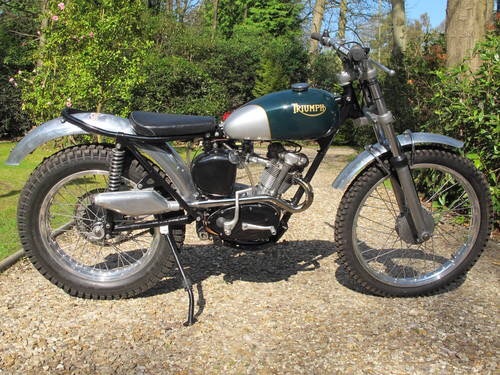 Not really the intent of today’s Terran celebrations but this here Scrambler looks the business for rainforest rambling, tundra trialling, sand dune swoops and countryside cavorting. 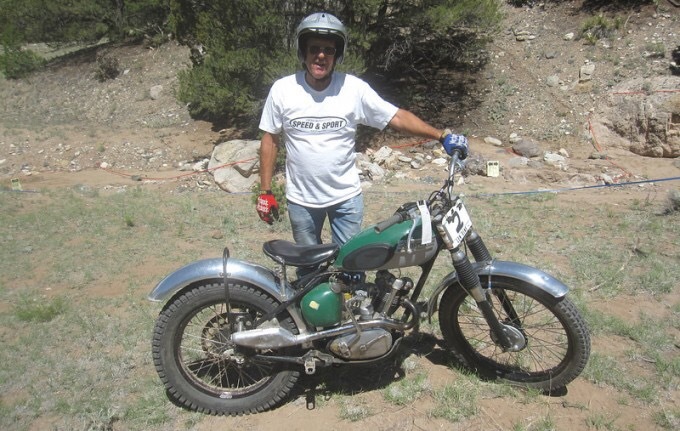 Knobby tires, imitation leather saddle and the coolness of a British bike. Earth awaits! The progression of fast. 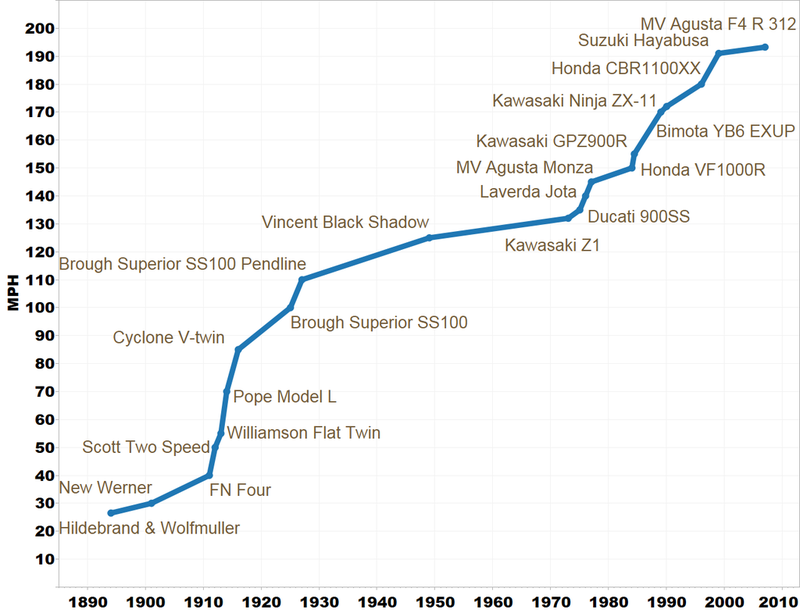 This chart represents the fastest production motorcycles over the last century. The decades long plateau reflects a half century reign of two British Greats: Brought Superior SS100 (TE Lawrence’s ride of choice) and the veritable Vincent Black Shadow. 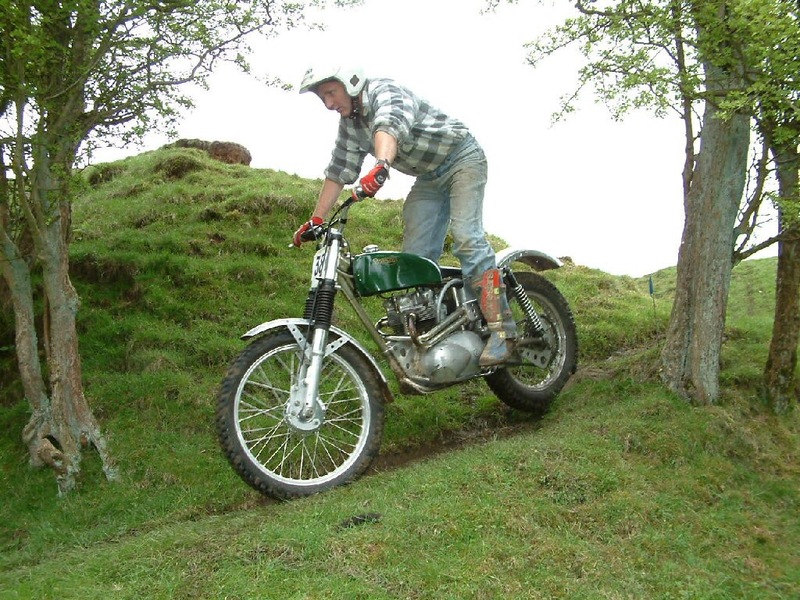 The steeper section have the early racing developments and the latter competitive superbike wars. 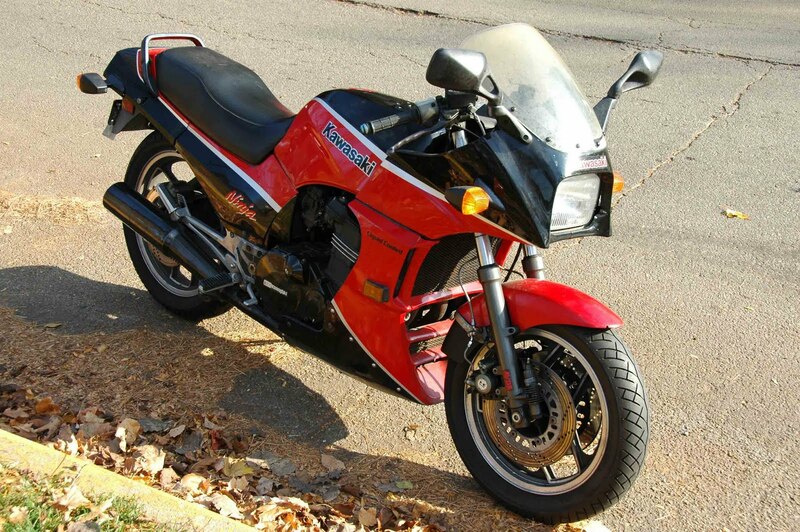 My 1985 Ninja 900 takes up a few years in the late eighties. Boots ‘n’ Denim. 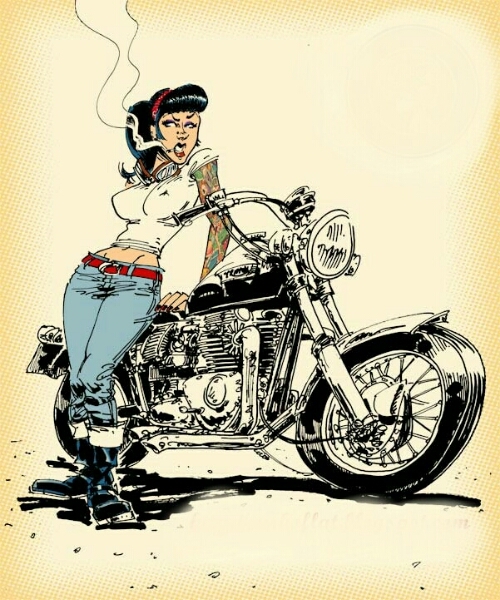 Classy smokin’ tattoo’d cafe chick looking mean enough to kick a period Bonnie into life and haul it down the road. 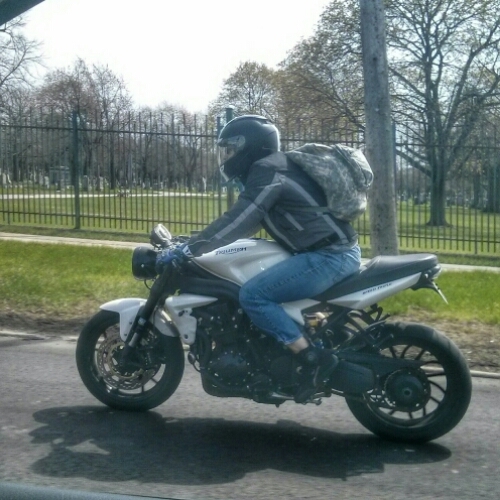 Pearly Triple: saw this nipping through Chicago traffic earlier today. 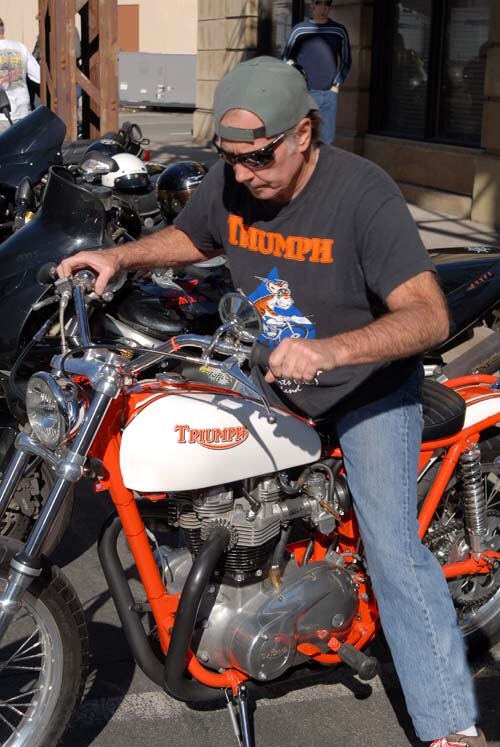 Triumphs Monster basher the Speed Triple. 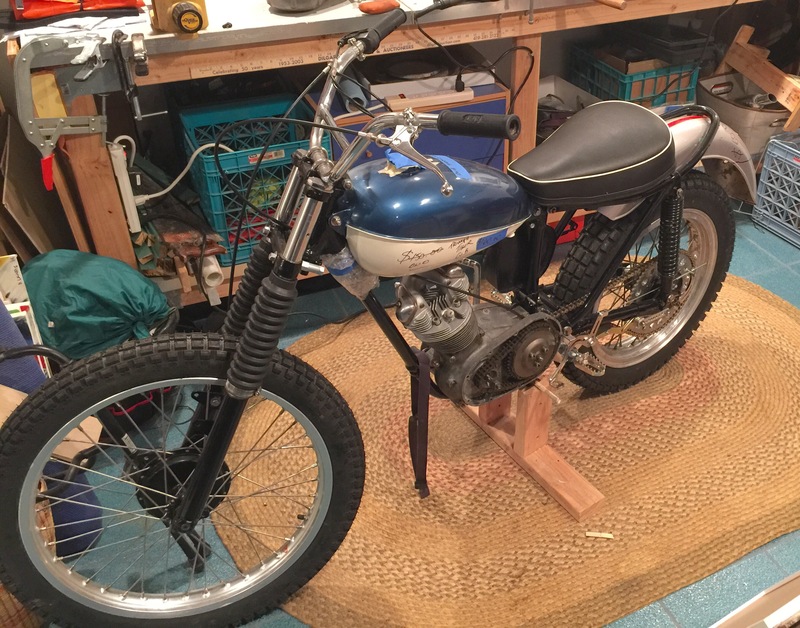 Narrow purpose with wheels, engine, brakes, suspension, and a seat. A clean machine in Daz White. Doll Face: someone’s idea of fun. 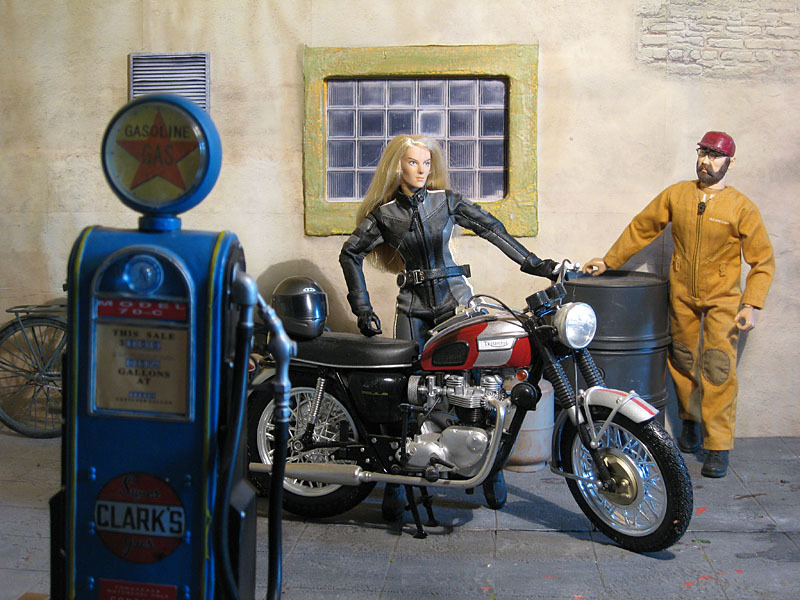 Propping an articulated figure onto scale model Triumph Bonneville. Shades of Marwencol, the model town fabricated by Mark Hogancamp (look up the documentary on Netflix). This acrylic lass is called Tamara Cool Girl Harley. 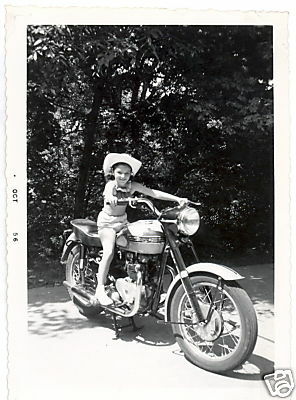 She has leathers too. Goon, poet, artillery signaller, Irish. That’s Spike Milligan who would be 98 today. 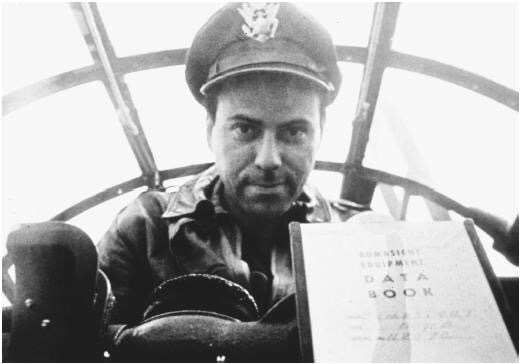 His off kilter buffoonery was fresh air in a world of stale comedy. And both your elbows free from glue. Don’t say it if your socks are dry! Or when the sun is in your eye! Just like my grandma used to say. Just like my grandma used to say! 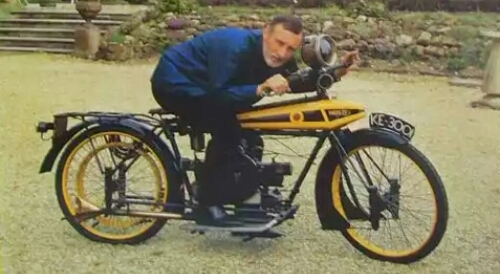 He sits on a Wooler motorcycle. Some publicity shot from the Veteran & Vintage magazine in 1968.